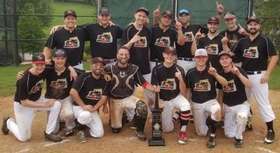 Pittsburgh NABA: League News: 2017 Pittsburgh NABA Champions! PITTSBURGH, PA - In the 15th year of the Pittsburgh NABA, three teams earned Championships on the field in their respective leagues of play. All three teams were expansion teams in the Pittsburgh NABA, marking the first time all three levels have had an expansion team crowned Champion in the same year. 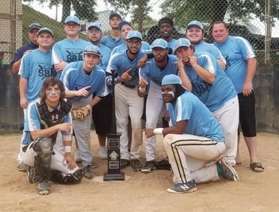 In Triple A, Steel City earned their first Pittsburgh NABA Championship on 8/3. In their first year of participation in the Pittsburgh NABA, the Dustin Mills led sqaud featured a talent-laden roster comprised of some veteran experience and saavy mixed an infusion of youth. Long-time teammates Mike Reeves, Dante Vaccaro, Tom Carter, Matt McCartney, and Milton Joyner joined Mills in celebrating their first NABA title after two regional titles in the NABF. Milton Joyner had previously won an NABA title with the Pittsburgh Hurricanes in 2009 prior to joining the Steel City squad. Newcomers Zarek Simkovich Frederick Donatelli made key contributions to Steel City during the playoffs as well. Steel City entered the tournament as the 4th seed after finishing the regular season 14-8. On their way to the Championship, they knocked off Ohio Valley in an elmination game, then bested the top-seeded Jefferson Hills squad in two games. The two-time Pittsburgh NABA Champion Clinton Cherokee took them to three games in the Championship, but Steel City ultimately prevailed. 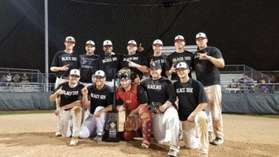 The Bakery Square Bandidos claimed the Double A title by besting the South Side Eagles on 8/6 for their first Pittsburgh NABA Championship. Managed by John Friend, the Bandidos rode great pitching and defense to the championship. Ryan Gallagher threw 10 innings allowing only two runs to the high powered Eagles offense, while Greg Friend added four innings of shutout relief. Eric Friend, David O'Leary, Nick Bondi, Zach Eddinger, and Cole Carlino contributed with tremendous defensive efforts and timely hitting for the Bandidos. Anthony Rauso caught all 21 championship innings and also contributed with clutch 2-out RBIs. The Bandidos finished their inagural regular season with a record of 17-7, earning the second seed in AA. They had a tough rough to the Championship, as they defeated Cranberry by a score of 1-0, and their series against the Express went the full 3 games prior to their advancing to the Championship. The Bandidos will join the Shaler Rebels in AAA next year as former AA Champions competing in the top Pittsburgh NABA League. Rick Helterbran led the Sheraden Jays to a 14-9-1 regular season record in their inaugural season. The second seeded Jays made quick work of of the Lions and Mariners in their opening rounds of play before facing the top-seeded Warriors in the Championship. Luke Gapinski, Tyler Sherrell, Brandon Blackistone, Dustin Baron, and Joel Akrie were top contributors for the Jays throughout the season.